The spin on this year’s cicada emergence has already started and it mostly misses the wonder of it all. Cicadas are commonplace in many parts of the world wherever there are trees, but they are mostly annual and exist in modest numbers: a familiar almost comforting buzz here and there in the treetops on a summer day. In the eastern United States, there are periodical (as well as annual) cicadas and they share a biological strategy, namely to occur in such large numbers that their predators can scarcely make a dent. Oak trees and beech trees do the same thing: in certain so-called “mast” years, they drop a staggering amount of fruits (acorns in the case of oaks). The animals that feed on their seeds eat their fill but plenty are left over to become the next generation of oaks or beeches. The passenger pigeon used to follow this strategy too. Passenger pigeons occurred in the eastern United States in enormous flocks, perhaps in the billions (explaining why “pigeon” is a part of so many place names in states like Kentucky). John James Audubon described their flights as darkening the skies for a day or more. Their nesting sites were unpredictable from year to year, so they more than saturated any predator pressure wherever they did happen to nest in any particular year. That worked splendidly until there was a predator with railroads and a telegraph: as a consequence, hunters could descend in vast numbers on a nesting colony and ship carloads of pigeons off to city markets where they sold for a penny a piece. It didn’t take long for the passenger pigeon to be driven to extinction. The last one, Martha, died in the Cincinnati Zoo in 1914. Aldo Leopold stated no “book pigeon” could replace what was lost. Indeed, it is hard to imagine the pigeon that Audubon, Washington, or Daniel Boone experienced. Maybe because people are less inclined to eat cicadas, the periodical cicadas do survive and they are just starting to emerge this spring. There are two main kinds: one which appears every 13 years and one that does so every 17 years. 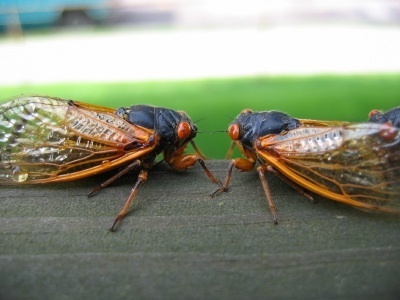 They have been well mapped by scientists over the years, so we have known for a long time that “Brood II” of the 17-year cicadas was due this May. Such cycle lengths might seem odd but they are quite meaningful: they are prime numbers that are large enough that no predator can build up a population that would make a serious dent in cicada reproductive success. Soon the adult cicadas will start emerging from underground in the millions, sitting still for their first hour as their exoskeletons dry and harden. Soon after, they begin flying around, almost like some kind of clumsy space creature with red eyes. That suffices, because their only business in a few short weeks is to find a mate, and for the female to lay the fertilized eggs in a small slit she makes near the end of a tree branch. While this is in process, they will be emitting their loud buzz to attract one another. Some people object to the noise though I find most restaurants are a lot noiser. Cicadas are about as harmless an insect as one can imagine. They don’t feed or bite as adults; they simply live off the energy they have acquired during their seventeen subterranean years when they are feeding on juices from plant roots. Sometimes it looks as if trees have been pruned when the bit of branch extending beyond the egg deposit wilts and drops off. As numerous as cicadas can be, they never substantially damage a tree. And as suddenly and as spectacularly as it started, it will be over. Quiet will return and the cycle will continue underground—in the case of “Brood II,” until May 2030. So rather than react in horror to what media in Washington have been calling “cicadagedon,” we really should revel in the wonder of it all. And, of course, it is fine if your dog indulges in cicadas. Cicadas are in fact quite nutritious, but like everything else it is possible to overdo. 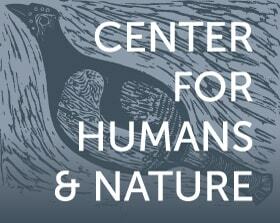 Thomas E. Lovejoy is an innovative and accomplished conservation biologist who coined the term "biological diversity." In 2010 he was elected University Professor in the Department of Environmental Science and Policy at George Mason University.